The installation went by without a hitch and it took me 22 min and 41 seconds to upgrade from Windows 7 to Windows 8 Professional. The upgrade was a quick, painless process and Microsoft have improved the installation process significantly and isolated the user interaction portions to the end which took me approximately 4 min to complete. Windows 8 radically changes the Windows concept, by removing the start button and introducing a new full-screen “Metro” based interface. The new metro interface is packaged together with the traditional “desktop” interface, but in this current iteration, the two operate in somewhat standalone silos. First, the traditional desktop interface allows you to operate Windows in the same vein as Vista or Windows 7, albeit without a Start Menu. Familiar features like the taskbar and the bottom right clock, notifications, my computer, windows explorer, control panel etc are all still present. While removing the Start Menu have traumatized quite a few users, you could easily add it back with third party applications. I hear that viStart or Start8 are pretty good. With either of these applications, you could easily replicate a Windows 7 interface without delving into Metro, while still benefiting from the improved speed and efficiency of Windows 8. 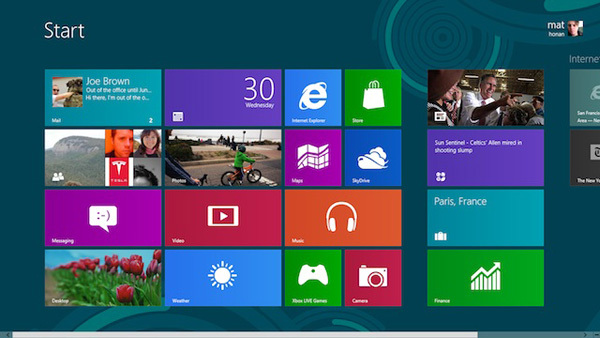 However, you would be missing out on the key Windows 8 feature, the Modern UI interface or Metro. It does feel more suitable for touch-based devices but in its current form, it is actually quite user-friendly once you figure out how to navigate about and the important shortcuts. Think of the new interface like the home screen launcher with widgets to provide you information at a snapshot. Metro apps are designed to be full screen and immersive. The full screen Metro apps radically changes how you use them. You can’t open a second window of the Metro Internet Explorer or Chrome, for example. The metro apps could be dragged and snapped to the sides, to allow for multitasking or sharing of information between apps, but they are primarily designed for full screen usage. It’s a radical change to PC use as more often that not, a typical workflow on a PC requires significantly more switching back and forth than you’d do on a tablet or phone. The apps itself are nicely designed. One thing Microsoft has done well since the Xbox 360 and Windows Phone 7 is the User Interface. Likewise, for the metro apps. I like how the People app collates all the Facebook updates and presents it in a easy to read and user-friendly interface. It is now my permanent Facebook browser. One issue I still have not reconcile is that there are metro apps and Windows applications. 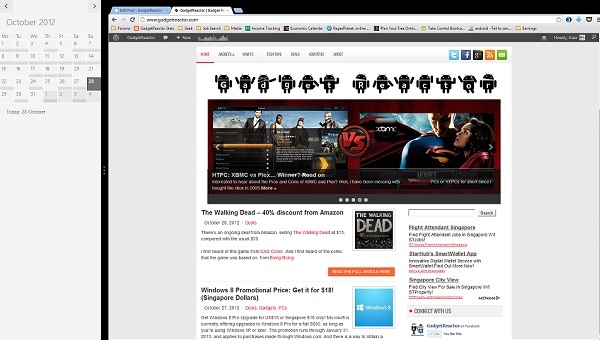 There’s a version of Chrome to be used in Metro and one in the traditional desktop. I find this arrangement quite confusing. After taking some time to explore and after some customisation, I am overall quite happy with the new Metro interface. However, it is still not good enough for my daily computing needs. For web-browsing, I still prefer the traditional desktop interface. It is also more efficient as I could resize the browser to a specific size, drag and drop between folders and browsers. This is not possible through the Modern UI interface and everything in full-screen feels too dumbed down. The strengths are more suited for a touch-screen, tablet or phone interface. However, for certain applications like mail, social media (Facebook), photo browsing etc, I would consider using the Modern UI as it provides a clean, simple interface for navigation. If you miss the Start Button, embrace search. Press the Win Button and start typing the name of the application or document, or friend or, just about, anything. For Metro apps, the first issue I had was trying to close them. Alt-F4 works. A cleaner way to close Metro Apps is to actually go to the top of the screen and drag the app to the bottom. Imagine there’s a trash bin at the bottom of the screen and you are dragging the app into the bin. To switch between Metro apps, either press Win+Tab or move your cursor to the top left corner of the screen and slide it down to have a drawer of the opened apps. Another useful ability was to dock the app to the left or right side. For e.g. you could dock the calendar to the left and have the browser opened in the right. If you are using a multi-monitor setup, you could determine whether the Windows 8 Start menu show up on either the secondary or primary monitor by moving to the bottom left corner on the screen of choice. It will remember this choice. Another useful multi monitor tip is to press Win+Shift+Left/Right to move windowed applications between monitors or Win+Pg Up/Pg Down to move metro apps. Microsoft should have just combined them. Other useful tips include the ability to name the tiled app groups on the Windows 8 start screen. You can drag the tiles around to order them, and if you want to name the groups, you can do so by moving the cursor to the bottom right and clicking on the small button. Right click on the group, and you would have the option to name the group. Something similar to the old Start Menu is to press Win+X. This brings up a menu for advanced options including the device manager and task manager. Speaking of which, the new task manager is great. Not only does it allow you to control the currently running apps, you could enable / disable those applications that run on startup. This could help improve the boot up time. 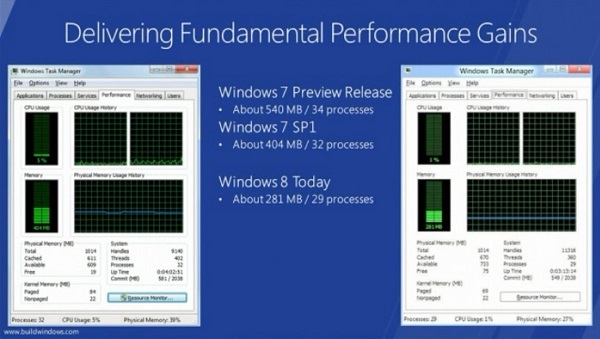 Windows 8 has optimised the number of processes and should be speedier than Windows 7. In my test, I took 20.37 seconds to boot into the Windows 8 environment. Previously on Windows 7, I took about 27 seconds. Hover your mouse over the top-right or bottom-right or press Win+C to access the Charms Bar. The Charms Bar gives you access to settings and power options to shutdown the computer. Weirdly enough, Microsoft buried the shutdown option in quite a weird location. To make shutting down a much easily accessible task, check out the following post from labnol.org. The code has been checked out and safe. Alternatively, navigate to the C:ProgramDataMicrosoftWindowsStart MenuPrograms directory and create a new shortcut -with the following command: shutdown.exe -s -t 00. You will now see the Shutdown button appear as a brand-new tile. To be updated. I have tried out a couple of games and generally, no problems thus far! I will update more in a separate post. I have seen quite a few negative comments on the web on the new Windows 8. Largely, the gripes are on the new user interface, but I feel that if you take the time to customize the start screen, it is every bit as fast and usable as the old start menu. With the snappier and less resource-intensive system, and at US$15 or S$18, it is a great time to upgrade.